Home / Economy / What’s left for Europe? A Cold War is now over. A sentence we have been hearing ever since the Berlin wall has fallen apart three decades ago. Who would say that the Cold War really ended up in 2019? The US withdrew from a landmark nuclear-weapons treaty signed with the Soviet Union in 1987 when the Cold War ended, because Russia has built a cache of missiles and refuses to destroy them. The start of the withdrawal process, which goes into effect in the first week of February, has the backing of the US’s NATO allies and represents the culmination of several years of failed negotiations with Russia. What appears to be Donald Trump’s toughest censure of Russian president Vladimir Putin would allow the US to rebuild a stockpile of intermediate-range weapons, potentially escalating a global arms race. Critics warned that pulling the US from the deal could result in Putin developing even more weapons, unconstrained. Chris Murphy, the Democratic senator from Connecticut, called the US withdrawal a “gift to Russia,” saying it “allows them to speed ahead with medium-range nuclear weapons without the watchful eye of the US.” The only winners of this withdrawal will be nuclear weapons’ manufacturers, said several members of Congress in a new bid to limit a new arms race. 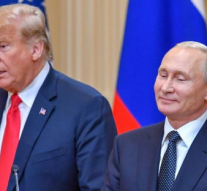 “Of course the Russians have been cheating on the INF treaty for years; the question is how we punish them for cheating,” said Jim Cooper, a Tennessee Democratic member of Congress. The terms of the treaty dictate that it takes six months to dissolve, and US officials and NATO expressed hope that Russia would change its behavior between now and then. If it does not, the US will be free to develop short and mid-range missiles weapons of its own, joining China, India, Pakistan, Israel, and North Korea—and raising fears of an arms race. The INF treaty signed by President Ronald Reagan and Soviet Communist Party General Secretary Mikhail Gorbachev banned land-based missiles of 1,000 to 5,000 kilometres. Some of the Prithvi and Agni class missiles in India’s arsenal could fall under the ambit of such a treaty, as well as some of Pakistan’s Babur, Shaheen and Ghauri missiles. Trump defended his decision to withdraw from the INF treaty saying, “Russia repeatedly violated its terms”. His ceremonial speech which had been postponed last month in the middle of showdown over the funding in the budget for a border wall by Speaker Nancy Pelosi, a Democrat, had calls for unity across the political divide. Since 2014, under the Obama administration, Washington has accused Russia of deploying nuclear-capable ground-launched missiles with a 2,000km range (the SSC-8) in Europe that are non-compliant with INF Treaty obligations. The US decision to pull out of the treaty will deepen the strains in the North Atlantic Treaty Organisation (NATO). Baltic countries insist Russia’s violations of the INF Treaty demand robust diplomatic and military counter-measures. The UK has lined up firmly behind Washington, blaming Russia for the breakdown. But Germany’s foreign minister, Heiko Maas, urged Washington to consider the consequences of withdrawal for Europe and for the future of nuclear disarmament. And the EU foreign policy chief, Federica Mogherini, said that INF constituted the European security. NATO stands to lose more from the INF Treaty collapse than Russia. Russia will be able to move ahead rapidly with the development and deployment of short and medium-range ground-launched nuclear-capable missiles. But, unlike in the 1980s, the US would face difficulty in finding allies in Europe prepared to station such missiles on their territory. Even though the only winners of these geopolitical and international law quarells are the nuclear companies all across the globe, nobody knows what will happen with Europe. Author of this article is afraid to summarize that nobody could ever predict what will be occurring within the “tampon” zone between the two rivals. Even though Europe still plays a very important role within the US` economic plans and a great market zone, it is not fully followed in the area of security and defence affairs, which clearly could be noticed as none of the Russian` nor the US` officials ever mentioned European states in relation to this agreement. We see Trump intents to involve India within this treaty framework, but if Russian side wasn`t too good, what`s left for India in the near future? What`s left for Europe?